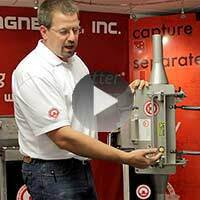 For Immediate Release: Posted On 3/10/2014 By Industrial Magnetics, Inc.
IMI recently released a new demonstration video of their Exposed Pole(EP) Tube Magnet for pneumatic line separation, showing how metal contaminants are captured in the unit’s magnetic field. Used ahead of processing equipment and bulk load- out stations to ensure product purity and protect machinery from tramp metal damage, the EP Tube Magnet is ideal for use in dilute or dense phase systems, especially where degradation is a concern. Typical applications include the processing of pelletized foods, feed or grain, fibrous products, or products that have a higher moisture content with a tendency to clog or congeal. To view the video, visit the EP Tube product page. For additional information, contact 888.582.0821 or email imi@magnetics.com.